In an effort to advocate for affordable housing and more inclusive cities, this competition seeks innovative proposals for inclusive urban housing options that challenge the dominant models of urban development by reversing ongoing displacements of low and middle-income residents from the city. Teams of multidisciplinary practitioners and/or students (graduates and undergraduates) are invited to articulate feasible proposals that respond to the imperative of inclusive housing by reacting to one of 5 case studies profiled in Beirut (Lebanon) with an integrated feasible development scheme in line with the competition guidelines. The competition seeks to address the affordable housing shortage in Beirut, one of the most expensive cities in the world. For the last year, a group of professionals in the fields of urban planning, architecture, economics and law have come together to set in place a joint “Affordable Housing Initiative” – in partnership with the Public Corporation for Housing - that advocates for the formulation and adoption of urban policies and the development of projects that counter ongoing practices.. Given the limitations of the current legal framework in relation to land and housing policies, the initiative operates as a short term advocacy platform informed by studies and surveyed cases, while it acknowledges the need for long-term novel policies and legislative changes towards affordable housing and an inclusive city. Jointly organized by Public Works Studio, the Order of Engineers and Architects in Beirut and UN-Habitat, the “Think Housing” competition is conceived as a pilot intervention for the “Affordable Housing Initiative”. It seeks to place housing at the forefront of the local debate on the possibilities of inclusive cities and affordability, by inviting innovative proposals and alternative ideas that challenge the dominant model of urban development and address the displacement of low and middle income residents from the city. Through five localized case in five neighborhoods of Beirut, the competition highlights the lack of alternative housing programs and planning practices that prioritize high profit generation, at the expense of all other parameters of urban inclusivity and sustainability. The public sector in Lebanon lags behind in its responsibility to set and enforce affordable housing strategies or programs, governed by comprehensive housing and land policies. Housing provision is thus relegated to private developers. More specifically, Beirut’s real estate landscape is characterized by unjustified high prices, and a vertical expansion at the expense of diversified types of housing. The glaring lack of adequate legislations and the disruptions of powerful private interests lead to an unbalanced growth, within avoid in urban and social policymaking. Since 1997, housing interventions have been restricted to subsidized loans through the Public Housing Corporation, a public agency under the authority of the Ministry of Social Affairs (MoSA), while the Ministry of Housing has been abolished. This move reflects a thin institutional and legislative framework to putting forward housing solutions, and, more importantly, with the lack of political will to consider housing a priority despite dire social repercussions. Due to the unbalanced housing supply, a substantial number of residents are forced to dwell in inadequate conditions, often in substandard living environment, lacking both tenure security and access to basic services. Others spend a disproportionate percentage of their income on rent, and remain trapped in the vicious circle of poverty. The constant fear of eviction for life-long residents of the city that has recently emerged in the aftermath of the rent law amendments and the lack of alternative solutions have strong consequences on tenure security, and cause social, psychological, economic, and political torments. The displaced population is pushed towards the peripheries, losing the remaining social and confessional mix in the city, in an already divided post-conflict context. The recent termination of rent control (8.5.2014, amended 28.2.2017) that removed a controversial mechanism protecting thousands of vulnerable households, combined with the influx of urban Syrians refugees, keep on straining the market with an increasing demand for affordable housing. Rent is the primary means of accessing housing in Beirut. According to a UNDP survey conducted in 2008, the percentage of households accessing housing through tenancy in Beirut is 49.5%. However, public policies that have been adopted are mainly geared towards homeownership, leaving the rental market severely unstructured. Long-time residents (tenants and owners), living in their neighborhoods since before 1992 account for an average of 35% of Beirut’s residents, reaching up to 60% in some neighborhoods, and have become an essential part of the city's life. The average share of old rents in the sample of old neighborhoods covered by Public Works (PW)’s research is 20% of total households. Religious and/or civil institutions contribute to providing housing in some neighborhoods and to stabilizing the old population; however it is restricted by sectarian parameters. The rate of evictions is very high, with an average rate of 200 cases of eviction in a block of 300 buildings. These evictions have a significant impact on the population, particularly on fragile and vulnerable groups with no recourse to justice and alternative housing options. A high percentage of old buildings and apartments are empty in the neighborhoods covered by PW research, but when one adds the rate of empty apartments in new buildings, it reaches record numbers (20% in the surveyed neighborhood of Ras Beirut). In both cases, this is much higher than the average 3 to 5% to reach a balance in the market between supply and demand. This stock of empty apartments constitutes an important potential for Beirut's affordable housing landscape. Transfer of land ownership from old owners to developers and/or real estate companies has become a common and abundant practice in the city. In a number of cases, a development agreement is signed between the owner and the investor for demolition and reconstruction. Sale and demolition motives are usually linked to various factors, including the income level of the owners of the old property who prefer to liquidate their property as they reach retirement and are in need of income sources, the state of the dilapidated building, or disputes between heirs. The majority of buildings in the old neighborhoods are owned by a large number of heirs or multiple shareholders in the same property. It is often difficult for the owners/heirs to subdivide the property due to the high incurred fees. Thus, they are left with no option other than selling the entire property to investors and real estate developers. Sometimes sales happen in stages, starting with the shares of those who do not live in the concerned property, until they reach all other owners and/or heirs. In order to enable the existing urban fabric in Beirut to maintain and enhance its potential in securing an affordable housing stock in the city, any interventions needs to address the aforementioned challenges which resulted in growing socio-economic inequalities, class and sectarian segregation, and spatial fragmentation inside Beirut’s historically and socio-culturally rich neighborhoods. The increase in real estate prices over the last decade has been accelerating at much higher rate than the increase in real income for most working residents in Greater Beirut area. A rule of thumb indicator for housing affordability is that in a well-functioning economy, a third of the monthly income of an average homebuyer should be able to support a monthly mortgage payment for housing. A simple calculation of his indicator in Lebanon, or in Beirut in particular, uncovers a grim reality. The average monthly mortgage payment for a small apartment in a Beirut’s suburb is $1208 for a property valued at $300,000 (this is calculated based on 25% down payment, 5% annual percentage rate, and 30-year maturity). For a homebuyer to be able to afford such a mortgage payment and get approved by the lender, their monthly salary is supposed to be three times larger, i.e. about $3,600. However, the average monthly income in Lebanon is nearly $1,500, which makes housing ownership in the suburbs of Beirut beyond affordability to most households, let alone within Beirut itself. A more realistic example should assume a property price of $450,000 for 100 square meters in Ras Beirut area, one of the 12 quartiers in the city of Beirut. This implies a monthly mortgage payment of $1,812. In the previous example, only mortgage cost was considered. However, one would want to include other housing overhead such as utility bills and property maintenance to reflect real housing cost. Residents in Beirut rely heavily on the private sector to buy electricity and water. Therefore, housing cost is estimated to reach 40% of the household disposable income. If we use annualized mortgage payment for reasons of conformity with data on GDP per capita, Beirut appears in the top four cities with highest housing price in a sample of selected 40 major cities around the world. Housing in Beirut proves to be more expensive than in cities like Paris, Tokyo, Rome, or Dubai, when using mortgage-to-income ratio based on income data provided by the World Bank. This fact can only contribute to widening inequality and crowding out a large proportion of Beirut residents out of their home city to seek housing in more affordable areas in the outskirts of Beirut and beyond. One can argue that this sort of gentrification is a natural process that is expected to emerge in the development cycle of any modern city. However, given the lack of proper infrastructure and reliable public transportation have made commuting to and from Beirut prohibitively burdening to most people to choose to live far from the capital city. In terms of government intervention in the housing sector, Lebanon does not have a ministry of housing. There are two semi-governmental agencies that are in charge of providing subsidized mortgage loans up to a certain limit. These are Banque de l’Habitat and the Public Corporation for Housing (PCH). Whether subsidizing mortgage loans through a reduced interest rate or exempting public servants from paying down payments on their home purchase, this housing allowance enhances the demand for housing and leads to increasing housing prices in the long run. The effectiveness of this kind of demand-side policies has long been debated by economists when compared to supply-side policies. Additionally, research on housing subsidies in the U.S. concludes that “a housing allowance program could further destabilize the housing market by further inducing households to move out of areas with high vacancy rates and low-quality housing and move into areas with low vacancies and strong upward pressure on rents. In this context, a housing allowance arguably could both add to abandonment pressures in some neighborhoods and stimulate excess demand pressures in other neighborhoods and still not evoke, at least in the short run, a positive supply response that would limit price increase.” From here, we can see how the adopted policy in Lebanon, mainly tackling demand-side management through interest subsidies, can have its limitations and often negative repercussions on the housing market. Supply-side policies vary from building public housing by the government to subsidizing housing production. The reason why supply-side intervention is more favorable is that it does not cause a housing price increase. While demand-side policies impose costs on non-participants by raising prices, supply programs may confer benefits on non-participants by lowering or holding in check market price increases. Most governments in industrialized and emerging economies have intervened to varying extent in providing public housing to the underprivileged. Each country presents a unique experiment in learning the best practice in order to devise a viable housing policy for Lebanon. Only a holistic housing policy framework with a long-term approach can tackle housing related issues. Along with an improvement/upgrading of the institutions, an effective planning guidelines and taxation scheme should be pushed for, in order to produce sufficient affordable housings. The introduction of a variety of new tools is to be considered in an improved urban framework, such as density bonuses, value capture, inclusionary planning, adequate zoning, and more. Besides, other modes of access to housing need to be acknowledged, especially when renting is the first entry to housing in Beirut/Lebanon. The schemes that are always put forward by the current interventions are too centered on homeownership and downsize other successful strategies, many tools can be used that have been proven useful to allow housing for vulnerable groups, in Lebanon and abroad. In fact, by using Usufruct practices, in principle similar to “Rente Viagère”, the beneficiary will be allowed to use and live in the home for as long as they live. Another tool, known as Waqef freezes the transfer of ownership of property over several generations in such a way to guarantee the remaining of residents in the same house for these generations. Furthermore, the creation of real estate companies can assure the sustainability and longevity of a housing project. Cooperatives also provide that sustainability in addition to other benefits with regards to taxation, ownership and decision making. Old rents law : Two different renting systems coexists, with different specific dynamics. The first one, is a system of fixed rents, covering rent agreements signed before 1992, which allows tenants to keep low renting housing, in spite of a rather high increase of the rents in the past decades. The second system covers rent agreements made as of the 23rd of July of 1992, which let the prices be decided freely by the tenants and the landlords, where a high increase of the prices was observed. The “old rent system”, as it is called, the system used before 1992, is widely seen as a problem, as it is strongly protecting the tenants, at the expense of the landlords. In 2014, and later in 2017, a very controversial law addressed this issue. It would eventually put an end to the rent gap in the housing market, by gradually increasing the rent, where after a period of six years, the rent value will become equal to the fair market valuation. Leaving aside the debate around the possible bubble forming on the Lebanese real estate market, it is though sure that the prices are disconnected from the reality of wages and the mechanism will lead to the displacement of a portion of the population. The competition is a single-stage design ‘Ideas Competition’ open to national and international interdisciplinary professional individuals, teams, firms and academic institutions and students. It is an open call for design proposals that will be curated in a public exhibition with a publication. The competition entries will be reviewed by a jury panel of local and international experts that will select a number of projects to be included in the publication and exhibition. The exhibition and publication aim at raising awareness and starting a public discourse about affordable housing and inclusive cities through the alternative design proposals for the different cases. The competition raises issues that call for skills in urban planning, urban design, public policy, architecture, economics, legal policies, and the social sciences. Thus, we encourage interdisciplinary thinking and a holistic approach of teams (of professionals, students or combination of both) who are willing to engage all of these disciplines. We recommend that a team includes at least an urbanist / urban planner. We are soliciting creative, sensitive, and feasible visions that include spatial configurations as well as programmatic and institutional proposals capable of balancing between social, legal, and economic needs. We urge colleagues, friends and city dwellers invested in the possibilities of an inclusive, socially responsible, and socially diverse urban future to respond to this call. (Members of the Organizer team, Competition Steering Committee, jury as well as their associates or and relatives, or any person who has been involved with the preparation or organization of the competition, shall not be eligible to enter the Competition or assist a participant in this competition). The competition is a platform for an open-ended debate about an important development issue in the city. To position the proposals as the starting point of a public debate about affordable housing and an inclusive city. To develop alternatives in which the existing fabric of the city continues to exist and play a role in the housing of all city dwellers. To situate the debate on the new rent law within a broader debate on the right to housing and the city. To inform city officials and governmental bodies of possibilities for the future of Beirut’s residents and engage them in the debate about the right to housing. To provide exposure to professionals’ work that engages urban issues, hence expanding their presence and role in contributing to the future of the built environment in Lebanon. To broaden our collective understanding of the meaning of place within a highly individualized profit-driven urban geography in Lebanon. The competition guidelines are drawn from the extensive research undertaken by members of the steering committee on the legal, spatial, social and economic landscape of housing in Beirut. The guidelines herein proposed are not mandatory, but seen as necessary to imagine what affordable housing in Beirut could mean, how the social fabric can be preserved, what spatial form it can take, and what program / institutional framework can supply it and sustain it economically, politically and environmentally. The market-led changing urban context [and financialization of the housing sector] renders the selected cases for the competition as vital examples of valuable home for the families inhabiting them and reflects the important role of the existing housing stock in the making of a just city. Recognize, Protect, and Enhance the features and modalities that contribute to making the neighborhood socially, economically, religiously and culturally diverse. Develop a strategy to enhance the existing affordable housing stock and expand it, while ensuring economic feasibility for landlords. Recognize the shortcomings of the existing legal framework and devise innovative legal solutions and tools emanating from the urban planning, building, and rent laws. Propose, in addition to your main proposal, legal amendments that are needed for the sustainability of your proposal, if any. Form your team. Teams should preferably be interdisciplinary and include expertise bridging planning, architecture, finance, economics, law, development. It is recommended to have at least one urban planner/designer on each team. Pick one of the 5 cases identified by the steering committee. Read the cases’ descriptions below and select the one you are most interested to intervene on. (You will need to have made your choice before logging onto the registration form). Fill and submit the online registration form: you will then receive a “starting package” according to the case you selected. Urban fabric: overview of the context in which the case is located in terms of building typologies, urbanization process, open spaces, etc. The case studies below have been chosen from 5 diverse neighborhoods in Beirut, are part of the existing built fabric, and have been part of the affordable housing stock in the city. The cases embody challenges that all city dwellers are facing, the complexity of the issues put forth in this competition and the housing crisis in Beirut. More specifically, these cases reflect the direct impact that the rent deregulation law had on the urban and social fabric of the city, and the repercussions on residents given other existing legal and economic challenges. The cases also offer varying scopes of intervention, be it at the level of the building, or the level of the neighborhood. urban transformation is increasingly jeopardizing the social diversity in Ras Beirut. Nowadays, the properties in this area are considered one of the most expensive in Beirut. These properties offer a beautiful sea view through AUB’s gardens thus allowing real estate agencies to sell luxury apartments at exorbitant prices that only a few can afford. Around 85% of the new buildings were built on the ruins of old houses in Beirut after they were evacuated or abandoned or demolished . Still, according to a study conducted in 2010, the vast majority of buildings in Ras Beirut are more than 40 years old for they were built before 1975. However, investors interests in Ras Beirut are not limited to new constructions, there is a growing trend of vacating old buildings to turn them into new investments such as luxury shops, hotels and furnished apartments being rented at a very high cost to a narrow group of tourists or students who can afford it. While threatening sustainable housing in the neighborhood, these transformations also do not account for a large portion of students studying at AUB and LAU and who cannot afford renting in such new developments. Moreover, Ras Beirut contains a high percentage of vacancy (around 20% of the housing stock according to a 2017 study by Public Works), some of which are new vacant buildings illustrating the discrepancy between the new apartments put up for sale or rent and the demand for affordable housing in Ras Beirut. There is a high percentage of buildings that have been abandoned since the civil war, and the ownership of a number of them belongs to the investors who bought these historical and abandoned premises and left them unoccupied. There are two buildings located on one lot in Ras Beirut that were built during the 1960s by the architect Sami Abdel Baki. The first building consists of 6 floors with two apartments with a surface area of 250 m2 each; 3 of them are vacant, 1 is occupied by one of the owners and the rest are rented by old tenants including elderly single women. The ground floor also consists of 2 apartments; one of them is occupied since 1967 by the Sudanese Cultural and Social Club (old rent) and the second one by new tenants. The Ground floor also includes two shops: Meridian Travel Agency that was recently turned into a cell shop (new rent) and a small grocery shop (old rent). The second building consists of 7 floors with one apartment on each floor of 300 m2. All of them are occupied by old tenants, 4 of which are middle aged women living alone. All tenants are facing the threat of eviction after one of the investors purchased most of the property shares incrementally from the owner’s heirs. The heirs’ lawyer, who was also responsible for collecting rent, played the role of the mediator in this transaction. However, one of the heirs is being pressured to sell the remaining shares but the transfer of property has yet to be published in the real estate registration. The investor’s interest in the new property lies in the fact that it’s located on a corner and the potential built-up area that the site allows: Currently, the total built-up area is around 7000 m2 while the permitted building area is 11877 m2. In the meantime, some tenants are negotiating the eviction indemnity while others weren’t even notified about the property transfer and the possibility of an eviction. This is an example of several contentious cases including the distribution of the estate, a divided decision within the same family and the pressure that affect people’s lives as well as the urban environment in Ras Beirut. It’s expected that the building will be sold again to another investor at a higher price, who plans to demolish the 2 buildings and build a set of luxurious apartments in their place. How can we reverse this practice and protect the old residents, increase affordable housing in the neighborhood and make a sustainable project while taking into consideration the high demand for student housing? Mousseitbeh has been known over the years for its population diversity. The area experienced various waves of demolition and eviction at different stages. The first one goes back to 1972, when the government decided to build Salim Slem road in addition to other new roads as the neighborhood became denser, entailing expropriations and the moving out of many families. That was followed by the construction of the Salim Slem tunnel in 1982 which negatively impacted the neighborhood. A lot of houses were demolished and the Mazraa area was separated from Mousseitbeh area. The residents tried to reconnect the 2 areas but weren’t able to reverse the impact of the highway in separating the 2 neighborhoods. Currently, a number of old neighborhoods in the region are threatened with complete demolition and eviction such as Abla St, Al-Sofh St, Al-Bacha St and A-Forn St. All of them are old residential blocks that survived demolition for different reasons. But its old tenants are still under a lot of pressure and are threatened with eviction. This case is based in Mousseitbeh; it consists of a building dating from 1955. The building consists of 13 floors and 47 residential units (4 apartments per floor mainly). Being located at a hill, it was the highest building in Beirut at the time and was used as a security control point. All of apartments were occupied by families who were still living under the old rent law but were evicted between 2014 and 2017 for demolition reasons. The total built-up area is currently 4125 m2 while the total permitted building area is 5582 m2. The property is divided as follows: 75% of the shares are owned by a real estate company established since 1968 and belongs to the same family of heirs who won 13% of the shares; whereas the remaining 12% belong to an owner from a different family. According to an investigation conducted by the Order of Engineers and Architects, the building structure demonstrates. The problematic in this case lies first in evicting tenants under the demolition pretense without critically addressing the reasons behind the demolition, why it is permitted if the structural conditions of the building are good, and second, in securing an affordable housing stock that allows these tenants to afford staying in this neighborhood. Al Bachoura area is located at a 5-minute walk from Downtown Beirut and a 10-minute walk from Monot Street. The neighborhood is characterized by old houses once owned by wealthy families and old gardens located in alleys near the main streets, where kids can play safely and the elderly can retreat. These common spaces and open areas, which sometimes include gardens, are often surrounded by small adjacent rooms. This building typology flourished following rural-urban migration flows during the 1950s and provided housing for workers either in the port area or in Downtown Beirut. Al Bachoura is surrounded by 4 highways: Fouad Chehab/Ring (North), Salim Slem (West), Independence (South) and Bechara El Khoury (East). This has resulted in enclosing this region and separating it from its surroundings. The trade sector in the region is flourishing and consists of small shops, artisans, woodwork, antiquity dealers, mechanic garages, small print shops, meat shops as well as stamp, carpet and glass manufacturing. The area is characterized by its prime location, attracting investments and thus land speculation activities. The expansion of Beirut Digital District is an example of how the ongoing investments in the area are erasing the diversified urban and social fabric. The case is in Dandan alley located in the old part of the neighborhood. It consists of 13 buildings of 1 or 2 floors built during the 1940s and 1950s. The majority of them are in need of a renovation or maintenance. Old tenants, owners and new tenants from different nationalities are currently living in these apartments. Nowadays, the residents are receiving offers to sell their properties, as it’s possible to multiply the built-up area in this neighborhood in accordance with its current zoning. However, the existing fabric and urban morphology make it impossible for an investor to buy and develop a plot inside the alleyway without having to buy and/or intervene on all the other plots. It’s also important to note that buildings located on the outskirts of the alleyway - some of which are vacant - pose a different set of conditions, as construction machines and vehicular access is feasible. The purpose of this case is to come up with innovative solutions to safeguard the alleyway and its residents in order to improve living conditions and benefit from the surplus of investments in a just and sustainable manner that could provide housing for the different social classes. During the French Mandate, Tariq El-Jdide counted very few buildings scattered between sand dunes. With the urbanization of the capital, urban growth began to reach this area that was gradually populated with Beiruti families and endowed with a number of public buildings and institutions such as the Municipal Stadium and the Beirut Airport in Bir Hassan. Over time, other migrants followed, most notably families coming from the area of Iqlim El-Kharoub and searching for education and employment opportunities in the capital city. The neighborhood kept growing with the arrival, during the early 1950s, of many Palestinian families to the neighborhood. They were attracted by the available empty residences in Tariq El-Jdide, at that time a newly developed neighborhood. The Arab University, established during the 1960s, attracted a large number of Arab students to the area and contributed to diversifying the population of the area with the arrival of Arab students who settled in the neighborhood as students. Today, the neighborhood is mostly known for its amenities for it comprises a large number of social and educational institutions in Beirut in addition to abundant restaurants, shops, small businesses, historical buildings and the Municipal Stadium. According to Public Works’ survey conducted in 2015 of 381 buildings in Tariq El-Jdide, 62 families were evicted and 98 others were threatened with eviction. Also, 27 buildings were demolished or threatened with demolition and 88 new buildings were built during the last 20 years on the ruins of old ones. This area is characterized since the early years of its construction by mid-rise and multi-story buildings. Changes in the building laws only affected a number of lots with low-rise and/or historic buildings, allowing a higher built-up area. That has resulted, after the rent deregulation, in investors seeking to make profit by evicting old tenants and either selling the same apartments or renting them at much higher rates. This case consists of a 7-floor building with 4 apartments each (ranging between 65m2 and 90m2), built in the mid-50s by architect Khaled Al Yacherti. The building was recently sold to two local investors who had promised to renovate the building. However, they resorted instead to selling all the building sections (the apartments, the concierge room and the roof) and giving the tenants two options: either buy the property at a price deemed unreasonable, determined by the investor, or evict them. The price ranges from 75 and 110 thousand dollars. However, the other apartments were pressured to evict in exchange for minimal indemnities (around 15 thousand dollars). Some tenants weren’t given the option to buy the apartments in which they were residing and that the investors sold to new owners without their knowledge. This arrangement led them to settle for buying apartments evicted by their neighbors in the same building as they did not want to leave the neighborhood nor had other housing alternatives within their means in the vicinity. There are still five apartments housing vulnerable old tenants who have no means to buy, so their apartments have been sold to buyers unknown to the residents. It is expected that the new landlords will resort to enforcing the new rent law, hence increasing rents in ways that could be unaffordable to the residents. Residents of the building are left feeling coerced by the investors’ decisions regarding their building without their consent. A building committee has formed recently in an effort to manage the chaos that the investor left behind. Historically, a number of institutions established in Mar Mikhael have attracted residents to live in the area: the train station in 1891, schools, hospitals and churches established by French missionaries, as well as a number of factories. In addition, Armenian refugees sought shelter in Karantina Camp at a close vicinity to Mar Mikhael. After the independence and during the 1940s, Mar Mikhael Street became a primary trade and crafts street, and the neighborhood housed many middle and low-income workers’ families. Al Roum hospital neighborhood - located at the hilltop adjacent to the street and once known for being a summer gateway for wealthy families - welcomed newcomers in the 1930s such as railway workers, workers of Beirut port, EDL employees and brewery workers. The property owners in Al Roum neighborhood narrate that they bought the lands and built houses near their workplace. During the 1950s and 1960s, the owners built new apartments above their house to rent them to newcomers due to the growing demand for housing. By 2006, Mar Mikhael was still a trades and crafts street located on the outskirts of the city and mainly populated by woodworkers, cobblers and craftsmen. Ten years ago, the neighborhood became a destination for restaurants, pubs and galleries because of low rent and the unique social and urban nature of the area. In 2014, around 50 new shops owned by designers and artists were counted in the neighborhood in addition to more than 50 art exhibitions, pubs and restaurants (GAIA Heritage Report). 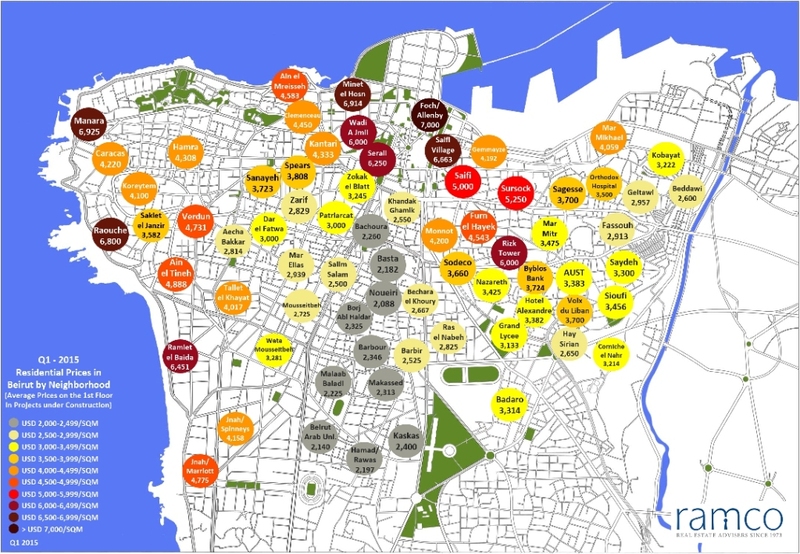 As a result of this urban change, the apartments prices in Mar Mikhael increased from 2,100 dollars per square meter to 4000 dollars between 2007 and 2015 (Mona Fawaz, Marieke Kreijnen, Daria Samad, article under publication). The increasing prices of properties had a significant gentrifying impact on the neighborhood including the residential hill known as Al Roum neighborhood. Looking at the property map of the region, we note a huge number of land and properties purchases. Residents who are leaving their apartments in the neighborhood are moving outside of Beirut specifically to the Northern Matn areas. This case is located on Mar Mikhael street and extending up to Khazine in Street in Roum Hospital area. It consists of 16 properties/buildings of roughly 5 floors. The ownership of some of these buildings was transferred to investors while other apartments were emptied for demolition reasons. Some families are being pressured since 2014 to leave their houses. Currently, the majority of the properties are occupied by new tenants from diverse nationalities. The total built-up area is 920 m2 while the permitted building area is 1103 m2. The problem with these residential units is that the majority of the buildings are owned by several heirs. Most of the times, it’s hard for the heirs to proceed with the subdivision of the property because of the high incurred fees. Therefore, it’s easier for investors and real estate developers to convince the owners/heirs to sell especially the ones who are not living on the actual property, thus forcing the small shareholders to sell their shares. Owners on their part resort to selling their property to use the proceeds to pay for retirement with no alternative sources of income or social services for the elderly, or in the case low-income earners needing to supplement their earnings. *The exact date and time will be confirmed and communicated at a later stage. The competition is organized as a collaboration between Public Works Studio, The Order of Engineers and Architects in Beirut, and UN-Habitat. The coalition of these three entities, referred to herewith as the ‘Organizer’, is the organizing and awarding party of this competition. The competition is under the patronage of the Public Corporation for Housing (PCH). The competition is financially supported by the Rosa Luxemburg Foundation and the AUB Neighborhood Initiative. Monica Basbous is a spatial analyst and designer. Her focuses include questions of urban mobility, social geographies, and the politics and representations of space. In 2016, Monica joined Public Works Studio as project manager and researcher. She is also co-instructor in the architectural design studio "Affordable Cities" at the Lebanese American University since 2017. Monica is a founding member of Qorras, a group working on the production and dissemination of queer feminist knowledge in Arabic. She holds a MSc. in Architecture and Sciences of the City from the Ecole Polytechnique Fédérale de Lausanne. Nadine is a practicing designer and urbanist, and co-founder of Public Works Studio. She researches socio-spatial phenomena through multidisciplinary methods; including mapping, imagery and film as both processes of investigation and representation. As part of her research on the implications of rent control on urban change and the processes of eviction in Beirut, she authored “Evicting Sovereignty: Lebanon’s Housing Tenants from Citizens to Obstacles”, and co-directed the short documentary “Beyhum Street: Mapping Place Narratives”. She is also a graphic design instructor at the Lebanese University. She holds a Bachelor’s in Graphic Design from the American University of Beirut and an MA in Urban Studies from King’s College London. Habib Debs is an architect and urban planner. In 1991, he founded Urbi, a group of architects and planners active mainly in Lebanon and the Middle East. He has since designed neighborhood projects in Paris region, Beirut, Cairo, Damascus, Bahrain, Jeddah, Ajman, Tripoli, and Benghazi, and participated in the development of strategic plans for several cities in the Arab world. He also contributed to the post-war reconstruction of Salima, Bint-Jbeil and Nahr-el-Bared. He holds a Master of Urban Planning from the Ecole Nationale des Ponts et Chaussées in Paris, a Bachelor of Civil Engineering from AUB and a Bachelor of Architecture from ALBA. Desiree Feghali is the founder of DF Legal Practice in Beirut. The practice is specialized in real estate and property law, business law, rent law, corporate governance, taxation and restructuring of businesses. She advises for construction companies, investors, retail holdings, startups and other businesses. She also conducted several researches on different topics and collaborated on the production of a study on affordable housing in Beirut. Desiree graduated from Saint Joseph University, is a member of the Beirut Bar Association and pursued several international programs, of which the St Gullen EMBL and NYU collaboration on International Taxation and the negotiation skills program at the Harvard Negotiation institute at the Harvard Law School. Tala Kammourieh is an urban planner and analyst. Her research is focused on land and housing policy, finance and rights. She joined UN-Habitat in early 2017 as the Housing Policy Analyst, currently working on HLP rights of refugees and developing a roadmap towards a national housing policy. Tala holds a Master of Urban Planning with focus on regional economic development from the University of Illinois and a Bachelor of Architecture from the American University of Beirut. Mona Khechen is an independent researcher and urban development and planning consultant. She has worked with several international organizations on supporting local and national governments in addressing the challenges of rapid urbanization, particularly the housing challenge. In addition, she has academic interest in the question of displacement and acted as research leader of the Gentrification and Urban Change in Ras Beirut Project – a joint collaboration between AUB and LSE. She obtained her doctorate in design degree for Harvard University, MSc in development and planning from UCL and BArch from AUB. Souheir Assi Mabsout, MArch in Urban Design from the University of Texas at Austin, has extensive expertise in leadership and management of urban development and university campus planning with an understanding of interdisciplinary approach in research and project development. She is a professional advisor on the management of design competitions which she also led, with projects’ outcome recognized on national and international levels. She managed the first Campus Master Plan study and was the head of the Planning and Design Division at the American University of Beirut (AUB). Prior to this, she worked at SOLIDERE as a Project Manager and Urban Designer and led varied types of projects including the development of design guidelines and manuals and oversaw their implementation. She was the founding manager of the Urban Development Division at the Management & Development International Company (MDIC) and was responsible for overseeing the design studies and implementation of a large scale real estate mixed-use development in Yerevan, Armenia, in addition to other corporate projects in Juba, Sudan. She served as a consultant on housing studies for AUB with focus on issues related to housing affordability and preservation of neighborhoods. Most recently, she served as a Senior Advisor to the COO of AUB on master planning issues, housing, transportation, and facilities management. She is an active member of the Civil Campaign to Protect Dalieh of Raouche and a member of the Executive Committee of ICOMOS. Abir Saksouk is an architect and urban planner, and co-founder of Public Works Studio. She has been involved in several research projects in Lebanon, including the history of informal suburbs, the social production of shared spaces in the city, and more recently housing rights and tenants claims in Beirut. She is interested in exploring how community engagement could be employed in planning and actively shaping the future of cities. Abir holds a Bachelor of Architecture from the American university of Beirut and a Master in Urban Development Planning from University College London. Dounia Salamé is a researcher in urban issues, and is currently the coordinator of the “Social Justice and the City” Program at the Issam Fares Institute at AUB. She is a feminist organizer and is interested in issues of public space, gender, spatial justice and everyday practices of the city. She holds a Masters in Urban Studies from the Institut National de la Recherche Scientifique (Montréal, Canada). Ali Termos is an economist and academic. He is an active consultant in financial innovation and valuation. He advises the private sector and the government on a wide range of topics that center on quantitative analyses and econometrics. Most recently, Ali worked for GFA consulting on public projects that introduced fiscal policy instruments to curb pollution and waste. He also worked extensively on modeling housing affordability for municipalities in Lebanon, devising a Home Price Index for Lebanon based on the theoretical foundation of Case-Shiller indices of single home prices in the U.S. Ali is the author of a number of peer-refereed articles in the area of Real Estate Research, Remittances and Monetary Policy. He holds a Ph.D. in Economics from North Carolina State University. Hiba Abou Akar – Assistant Professor at the Graduate School of Architecture, Planning and Preservation at Columbia University. Hiba Bou Akar is an Assistant Professor at Columbia University’s Graduate School of Architecture, Planning, and Preservation (GSAPP). Bou Akar’s research examines the geographies of planning and war; the question of urban security and violence, focusing on the role of religious-political organizations in the making of cities. Her forthcoming book, For the War Yet to Come: Planning Beirut’s Frontiers (Stanford University Press, 2018), examines how Beirut's post-civil war peripheries have been transformed through multiple planning exercises into contested frontiers that are mired in new forms of conflict. Her first co-edited book, Narrating Beirut from its Borderlines, incorporated ethnographic and archival research with art installations, architecture, graphic design, and photography to explore Beirut’s segregated geographies. Bou Akar received her Ph.D. in City and Regional Planning with a designated emphasis in Global Metropolitan Studies from the University of California at Berkeley. She holds a Bachelor of Architecture from the American University of Beirut (AUB) and Master in Urban Studies and Planning from the Massachusetts Institute of Technology (MIT). She was a postdoctoral fellow at Harvard University’s Mahindra Humanities Center, and is the co-editor of Jadaliyya Cities, an online electronic journal addressing urban issues in the Middle East. Kawthar Dara is a researcher and public finance management advisor with around 25 years of work experience in diversified disciplines, particularly in socio-economic development and public financial management. She led and participated in several modernization and reform initiatives in the Government sector, mainly in the Ministry of Finance, NSSF, CDR, Ministry of Education and Higher Education, Ministry of Social Affairs and others. She has long standing experience with major donor and international organizations such as the World Bank, DFID, UN and others. She held different posts in project management, coordination, capacity building, and public sector reform and in socio-economic research. She worked for around 10 years as a senior researcher, and she supervised and participated in tens in researches, studies, covering a wide spectrum of socio-economic areas, including poverty, consumer price index, labor, education, health, planning, SME’s, gender, and others. She holds a Bachelor of Sciences from the American University of Beirut and was intensively trained as economist. Marwan Ghandour is a Professor in Architecture and Director of the School of Architecture at Louisiana State University. Since his graduation, he taught at the American University of Beirut and Iowa State University as well as co-founded Bawader Architects firm in Beirut. His research includes: Comparative Urban Regeneration strategies in the Global South; the Expansive Space of the Modern State and its Urban Management Tools, and Design at the Geo-communal Scale where ecology, urbanization, infrastructure, and politics are integrated. The research is focused on the Middle East, the American Midwest, Peru and Rwanda. Marwan Ghandour holds architecture degrees from the American University of Beirut and Columbia University in New York. Elie is an academic teaching theory of architecture and design studios at the Lebanese American University in Lebanon, a practising architect heading EMH Architects, and the founder and editor-in-chief of ArchiLeb: The Lebanese Architecture Portal. He is also a board member of the Arab Centre for Architecture. Following graduation from the Académie Libanaise des Beaux-Arts (2000) and a professional career in Lebanon, he was awarded a scholarship for a Masters in Architectural History at the Bartlett, University College London (2005), after which he returned to Lebanon (2007) where he has been actively involved in local architectural discourse whilst engaging with Western academia through lectures, conferences and publications. His interests revolve around the particularities of local expressions of architectural modernity within a culturally diverse society focusing currently on the history of social and affordable housing in Lebanon. Adrian Lahoud is Dean of the School of Architecture at the Royal College of Art. Prior to his current role at the RCA, he was director of the MA program at the Centre for Research Architecture-Goldsmiths, and a research fellow in the Forensic Architecture ERC-funded project; studio master in the Projective Cities MPhil in Architecture and Urban Design at the Architectural Association; and director of the MArch Urban Design at the Bartlett, University College London. Before starting his office in Australia, Adrian worked for a number of notable practices in Sydney across a wide range of scales and disciplines including art, landscape architecture, architecture and urban design. Key projects include a competition entry for a cultural center in Istanbul and a research proposal exploring forms of co-existence between high-density development and historically significant inner city areas. Alongside his architectural practice, Adrian worked with partners in a collective titled ‘N’ that set out to increase the density of cultural opportunities for young artists and architects in Sydney. Since June 2014, Rony Lahoud has been the Chairman and General Director of the Public Corporation for Housing, a member of the Higher Council of the Directorate General of Urban Planning and a board member of the Central Fund for the Displaced. He has extensive consulting experience, working for Murex Consulting before moving to Iridium Consulting LLC where he became Head of the Middle East Division for two years. He also served as a Lieutenant Engineer in the Military Housing Section of the Lebanese Army. Rony holds a Master of Engineering in Electricity and Electronics - Computer and Communication from the Lebanese University - Faculty of Engineering II. Maysa is currently an independent consultant. Up until March 2018, she was the Affordable Housing Institute's Managing Director for the Arab World. Under her leadership, AHI worked on a variety of housing related projects in the United Arab Emirates, Saudi Arabia, Kuwait, Qatar, Lebanon, Morocco, and Algeria. She has experience in the US where she worked for NYC's Phipps Houses Group, a large nonprofit housing developer, Mass Housing, Massachusetts's state housing bank, and Fenway CDC, a community based affordable housing builder. Maysa has a bachelor in Architecture from the American University of Beirut, a Master degree in City Planning from the Massachusetts institute of Technology and an MPhil in Real Estate Finance from the University of Cambridge. Nizar Saghieh is a leading lawyer, legal researcher and human rights activist. His primary focus includes the independence of the judiciary in Lebanon, the penal code, memory of war, social justice, and rights of the legally marginalized. In addition to his wide legal consulting portfolio, Saghieh is the founding member of the Legal Agenda and its executive director since 2011, a platform that monitors and analyses law and public policy in Lebanon and the Arab Region. Jad Tabet an architect and member of UNESCO World Heritage Committee and Vice-President of Patrimoine Sans Frontières, an NGO based in Paris. He graduated in architecture from the American University of Beirut in 1969. He is a practicing architect and urban planner between Beirut and Paris and won several awards. He is a known critic of architecture, lecturing regularly and teaches at Sciences Po-Paris School of International Affairs. He has published extensively on Beirut and served as director of the Beirut Workshop School of Architecture Paris-Belleville. Jad is currently serving as Head of the Order of Engineers and Architects in Beirut. The competition entries will be reviewed by a jury panel of local experts who will select a number of projects to be included in a publication and an exhibition. The proposals will also be disseminated through the Housing Monitor, an interactive platform that monitors housing conditions and evictions in Beirut. The exhibition, publication, and monitor aim at raising awareness and encouraging a public debate about affordable housing and inclusive city through the alternative proposals for the different cases. The winning schemes will also be disseminated to local and international actors concerned with/ involved in housing in Lebanon, and will act as pilot projects for the forthcoming PCH housing initiative. The competition will include a monetary award, certificates of achievement, and honorable mentions, publications and exhibition. A total of USD 4,000 will be awarded to the winning team(s). Municipalities' law: provides the powers and duties of municipalities especially with regards to the municipality’s intervention at a social level. Municipal taxes and fees Law: provides the taxes gathered by the municipalities, it also provides for the exemptions. Real property ownership law:: provides on how property is held, maintained, divided and transferred. Also focuses on provisions relating to usufruct (استثمار) similar to “Rente Viagère” concepts and Waqef. Research on Housing Law: includes the “Leasing law” that provides rules and regulation on applying leasing terms in Lebanon, as well as the “Law of the establishment of the Public Corporation of Housing” that provides for the powers and duties of the PCH, its sources of funding and options of spending. Cooperatives’ Law: provides the rules and regulations for the creating and functioning of cooperatives, with focus on Housing cooperatives. Associations’ Law: provides on the rules for establishing NGOs. Urbanism law: provides tools for the planning of Lebanese territories and the making of local, regional or national masterplans. Law on the Exemption of the housing property groups of the Ministry of Housing and Cooperatives from some allotment regulations. Rent Control Laws Overview : Provides all relevant information to the Old rents law (1940-2017) to review the evolution of rent control. Q: How do we register for the competition? A: Once you have formed your team and selected the case study you wish to tackle, go to the website www.thinkhousing.com. You will find on the main page a “Registration Form” button that will take you to a form you will have to fill and submit. You should receive an automatic confirmation email if your registration has been successful(check your spam folder). For instructors wishing to register their classes, there will be another button “University Studios Registration Form” on the main page. Q: How many team members do we have to have? A: Minimum number of members per team is 1, maximum number of members per team is 10. Q: Is there a preferred disciplinary composition of the participating teams? A: We encourage multidisciplinary teams, but our main recommendation is that there at least one of the team members, have a background in urban planning/studies. Q: Is there a registration fee for each team? A: No, registration is free of charge. Q: Can the team consist of both students and practitioners? A: Yes. Teams can consist of students only, students and practitioners, or practitioners only. Students can work under the advisory/supervision of a faculty member. Q: Is this a design competition? A: No, it is an Ideas Competition that could include but is not limited to design. Q: We’re interested in participating in the competition. What is expected from us to do? A: You’re expected to first pick one of the five case studies listed on the competition website, and come up with a comprehensive, feasible and responsive scheme responding to the case problematic and the competition principles. Q: How much time will we need to work on this competition? A: You have about 3 months to work on the competition, and the earlier you register the more time you’ll have to work on it. It is enough time for practitioners with full-time jobs and students with semester coursework to be able to work on it outside their duty hours. Q: Can we work on more than one case study? A: No, each team can only pick one case study to work on. Q: Can we propose another case study that we find equally interesting and want to work on? A: No, the teams need to abide to the 5 case studies that are listed on the competition website and in the brief. Q: Can one team submit multiple proposals for the same case study? A: No, each team will submit one comprehensive proposal for the one case study they chose. Q: We’re facing an issue with the registration form. A: Please email us on info@thinkhousing.org with details (including screenshots) of the problem you are facing and we’ll do our best to resolve it in a timely manner. Q: Can one proposal win more than one prize? For example 1st prize and honorable mention, honorable mention, etc. A: Yes, it is possible, however that is up to the jury panel to decide. Q: Do we have to have a member registered with the OEA to be able to participate? A: No, membership with the OEA is not required. Q: Is the competition open to international participants? A: International entries are welcome, but knowledge of Arabic language will be needed, since most of the needed resources and official documents (laws, regulations, maps etc.) are in Arabic. Q: On what basis did you select the case studies? A: The case studies embody challenges that all city dwellers are facing, the complexity of the issues put forth in this competition and the housing crisis in Beirut. More specifically, these cases reflect the direct impact that the rent deregulation law had on the urban and social fabric of the city, and the repercussions on residents given other existing legal and economic challenges. Q: Would our proposals be implemented? By who? A: The winning schemes are meant to be tools to open a wider debate on the possibility of affordable housing in Beirut. They will be starting points to lobby with state institutions on the implementation of such schemes. Q: What is the expected geographic scope of our interventions: the building, neighborhood or city scale? A: Depending on your case study, the scope can be either at the building or at the neighborhood level. Sustainability and replicability of your proposal can take into consideration the city scale if applicable. Q: Can we approach the topic from a broader perspective without necessarily limiting ourselves to the case studies subject of this competition? A: No, it is important to respond to the case studies subject to this competition and stay limited within the perspective of affordable housing provision and access as the main theme of the competition. This topic is wide enough to encompass multiple disciplines, approaches and perspectives. Q: To what extent do we need to take the current regulatory/legal system into account? A: You should use all available resources within the existing legislature to develop realistic solutions. However, knowing the shortcomings of the existing legal framework, you could suggest innovative legal solutions and tools for the future that would enhance said framework and ensure the sustainability of your intervention, but in any case the proposed projects for this competition should abide by the existing laws and regulations. Q: What do you mean by economic feasibility? A: This implies the highest economic value per residential square meter i.e. the proportion of land value to built area is lowest. In reference to section 5.1.7.B4 of the brief: This document shall be considered as an addendum to the competition brief, thus an integral and officially binding part of the competition. 1. Should the proposals be implementable? The proposals are meant to provide the best scenario for housing rights whilst competing in the ‘real world’. That being said, there are a lot of possibilities that are not being activated, not because the current legal setup does not allow for them, but because the political will to advance housing rights is absent. Nonetheless, it is important to acknowledge the shortcomings of the existing framework, and propose legal amendments whenever applicable. 2. Should the law protecting heritage buildings be taken into consideration? There is no law in Lebanon that requires the preservation of heritage buildings, but there are scattered buildings in Beirut that are on an administrative inventory of heritage buildings, making it difficult to obtain a permit for their demolition. However, many owners resort to the State Council to remove their building from that inventory. In the context of this competition, and the fact that the chosen interventions focus on the old existing built fabric, the correlation between the physical heritage and social sustainability / preservation is key. Accordingly, acknowledging the value of historical neighborhoods includes acknowledging the value of social and physical (building) networks that were produced over a long time, which include different layers of social support and collective memory, an important component of a community’s well-being. Thus, we encourage proposals to consider the potential of the existing built environment for possibilities of affordable housing, and to consider that housing is more than just shelter, as it includes a social component and other resources that a neighborhood can provide. 3. Can the proposed solutions include demolition or eviction or alternatives for the current tenants? The core principle of the competition is to find solutions that avoid evictions and acknowledge the value of historical neighborhoods. If the suggested solution involves demolition, it needs to be thought of as surgical and not as erasure, justified socially, economically, legally and geographically, and its benefits need to outweigh the decision to keep a building. If the proposal involves evictions, it also needs to offer dignified relocation of residents, taking into consideration their socio-economic conditions. 4. To what extent should we consider the investors’ interest? Investors’ interests are to be considered only if relevant to the proposal, but it is important to remember that this competition is seeking alternative models for urban development and the prospects of influencing policy changes. Accordingly, the interests of the developers should not come at the expense of the interests of other stakeholders, especially the dwellers. 5. Is there an article or source explaining the difference between the old and new rent law? 6. Is there any market analysis of the areas that we can refer to it as benchmark for the prices and rents of new apartments in the area? 7. Some cadastral registries show that there are buildings reserved for the National Treasury; how to deal with them? In case the government decides to collect the owed money, the building will be sold at 60% of its actual price through public auction in court. Currently the government is not pursuing any collect. 8. With reference to Appendix A: economic tools document, how did we get to the 107,000 USD in terms of real capital gain? According to the document the inflation between 1995 and 2015 is 71.5% so the present value of the apartment is 257,000 USD and it was sold at 300,000 USD. Isn’t the real capital gain 300,000-257,000=43,000 USD? We hypothetically assumed that the Consumer Price Index (CPI) in 1995 is 105 and CPI in 2015 is 180. Inflation over the 20-year period is [(180-105)/105]*100=71.4% so on average, inflation rate was 3.57% per year during that period (again, if the CPI was estimated correctly). Therefore, the real value of $150,000 paid in 1995 in 2015 dollars is equal to 150,000*(180/105) = $257,142.85. Hence, the net real gain of this sale is the difference between 300,000 and 257,143, i.e. $42,857. 9.Does the Banque du Liban provide any funding for developers to build affordable housing? Does any other institution provide this sort of funding and condition? 2- إقراض الأفراد ولا سيما ذوي الدخل المحدود والمتوسط من أجل شراء أو إنشاء أو ترميم او اكمال او توسيع او تحسين مساكنهم, وتمويل التعاونيات السكنية. 2- Granting individual loans especially for low and mid income families in order to purchase, build, renovate, pursue, expand or improve their housing and funding housing cooperatives. 10. Do we have a law that shapes the loans issued to developers by the banks? If so, can we have a copy of these laws or policies? And if these are unique to each bank, are they usually made public or they are usually customized to specific clients? No, there is no law specifically for that. Usually the bank drafts a regular loan agreement where the developer has a schedule of payments he has to commit to. The bank usually puts a hypothèque (mortgage or تأمين or رهن) on the property until the full amount is repaid. The bank also gives the option to divide the mortgage separately on each apartment once it is sold, provided that the new buyer pays directly to the bank. 11. What does FAR mean? Is it the surface exploitation expressed as a percentage of the plot size? It is the ratio of the total floor area to the plot size. 12. What is TER? Is it the total built up area expressed as a factor of the plot size and excluding the balconies, vertical circulation core and double walls? TER is the Total Exploitation Ratio. 13. The text in many essential documents is in Arabic, which restricts all international competitors, like our team. Could you please provide a translated study? We assume all participants would have come across this condition before registering. Therefore you might need to find an Arabic speaker or a translator, as the documents are not available in English or French. 1. In the case of Ras Beirut, do we have to take into consideration the demand for student housing in our strategy? You can gear your proposal as you want as long as it takes into consideration affordability, accessibility, sustainability and the existing social fabric and groups. It is our recommendation to take students’ social group into account, as they highly influence the urban environment in Ras Beirut. 2. Will you provide a more complete base map of the case study? For example: CAD file with precise cadastral limits and building(s) footprint. Clarifying documents have been distributed to the teams that have chosen this case study. 3. The provided information regarding existing buildings is highly unclear. According to the brief, it should be two 6 and 7-floor buildings. After registration, we received the additional folder [00 RB new floor map building 2] with .dwg plan of the building, which can be understood, that it is located on the north of the site. Apart from that, in the folder [00 RB floor maps and cadastral] available another two floor plans of other buildings that definitely have different shapes compared to the second building which can be seen in Google maps, cadaster plans and photos from provided materials. Thus, do you have more understandable floor plans? 4. The given floor plans of the building do not carry any information about the structure of buildings. It is unclear what kind of reconstruction can be initiated on the existing buildings. Could you please give broader information about the structure of the buildings? 5. The provided information of case study does not contain a site plan (for instance 1:500 or 1:1000). Availability of the site plan is highly important to make the proper analysis and produce the right architectural proposition. Is it possible to get a site plan? 1. Is there a water well in the building? 1. What does the white color represent in 1169? The color white in the occupancy diagrams in all the 5 cases means that the apartment has not been surveyed. At the time of the survey, fieldworkers were not able to gather information on these specific apartments. 2. Is it possible to propose the establishment of cooperatives in these areas if such a solution can be applied? Yes, all suggestions are valid as long as they are supported by arguments at the social / economic, legal and spatial levels. The “Competition Resources” section also includes a document titled “Cooperatives Law”, which provides the rules and regulations for the establishment and operation of cooperatives, with a focus on housing cooperatives. 1. In the occupancy sections, there are only 13 properties, not matching the highlighted maps. For example: lots 652 and 551 are on the maps but do not correspond to any sections. Could you please specify the 16 exact plot numbers included in our case? If in your documents you have missing info on some plots, it is because we were not able to survey floor by floor. Whenever there is missing info on a floor by floor survey, you can refer to the occupancy map that shows the majority’s form of occupancy. Additional info on missing plots have been distributed to the teams that have chosen this case study. 2. Besides the interviews, are there any documents or information about the demographics of the occupants of these buildings? Occupancy table and occupancy per floor documents are the main documents about the demographics. You can also refer to the compiled study for an overview of the demographics. 3. Is plot 1248 part of the cluster? Is plot 1249 joined to 1248 or 1250? Yes, 1248 is part of the cluster. 1248 and 1249 are two plots as shown on the cadastral, but it is one building built on both plots. They are not joined to 1250. (Clarifying documents have been distributed to the teams that have chosen this case study). 4. Which plot do images 5989 5990 5991 refer to? Plot 1245 or 1253? Is it considered one building? Clarifying documents have been distributed to the teams that have chosen this case study. (Note: Plot 1253 is a leftover sliver of land, not a buildable plot). 5. Image WPQR3812 seems to belong to another site. Can you please confirm? Yes. Image WPQR3812 is off Mar Mikhael street further away from the site in question. 6. According to the file MM Occupancy table, 920 sqm is the total existing built up area and 1104 is the allowable BUA with 184 sqm that are in surplus. Can you please explain these figures? Which BUA do they refer to and if 920 is the existing BUA then how come the allowable is only 1104 sqm? The current building code allows an increase in the built-up area of about 140% due to the consideration of double walls, vertical circulation and elevator core in addition to the 20% balconies which were exempted from the allowable BUA. There are 19 plots in the selected zone, consisting of 16 buildings (plots 1248-1249 have 1 building; plots 1255-1513-1774 have 1 building). The total area of the selected zone (all 19 plots) is 5,660 sqm. The current total built up area is 11,619 sqm. See attached excel sheet breakdown (sent along the additional documents by email). Hence the difference is around 15,000 sqm. However, you are not bound to choosing the entire zone as your BUA investigation. As per the urban planning law, you can join the exploitation factors for any adjacent plots.